If you want a delicious low calorie salad recipe that’s easy to make and would make a great addition to your Weight Watchers 4th of July Recipes, then you came to the right place today! 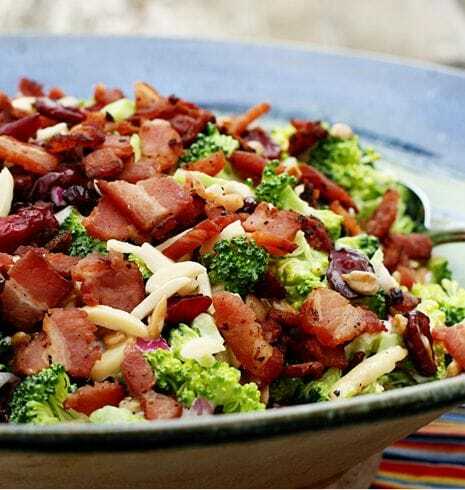 This Broccoli Bacon Salad Side Dish Recipe is a wonderful and healthy addition to just about any meal. Instead of the same old boring salads you see at every Fourth of July BBQ, why not live things up with this tasty salad instead? With each 1 cup serving having just 2 Points, you can serve a delicious dish that everyone will love while still staying on track with your Weight Watchers goals. And did I mention it has bacon and mayo?!?!!? Yeah….this one is a must try! For just 2 Points per serving, why not serve this healthy side dish recipe at your summer barbeque this year? Or take it along as Weight Watchers friendly dish to a potluck! Either way, it’s a tasty low calorie salad recipe that everyone will love and will still help keep you from going overboard with your daily Points Allowance. Whisk garlic, mayonnaise, yogurt, vinegar and sugar in a large bowl. Add broccoli, jicama, onions, bacon, cranberries and pepper; stir to coat with the dressing. Not as available, adds O taste, but lots of crunch. Sub celery Instead… ???? You can par-boil it… My family enjoys the crunch of the raw broccoli; as a side note, I see sunflower seeds in the picture but they are not included in this “healthier” version. I also substitute celery for the jicama because it’s more plentiful and much cheaper, also adds a little taste… ???? Yummm-mmmee! Had to modify slightly using what I had on hand, but the result was very gooood. I never would have thought that combination of flavors and textures could taste this good! Is it fresh or cooked broccoli? I’m assuming fresh? I want to try it with cooked broccoli, and let it chill before serving. What did you use? I don’t know how easy it’s going to be for me to find jicama. What can I substitute it with – any suggestions? I loved this dish. It was easy to make and easy to add or change veggies to taste. Thanks for all the great ideas and make eating healthy fun!!!! !